Residential solar power has taken Australia by storm, with the roofs of more than 1 in 10 suitable homes now equipped with solar panels. What size solar system is right for a given home depends on the incentives & prices available at the time of installation, as well as on the electricity needs of the home or business in question. Generally speaking, 10 kilowatts (kW) is the largest size generally deployed for residential applications in Australia. An 9kW solar system–between this 10kW upper limit and extremely popular 5kW solar systems–is ideally suited for a household whose electricity usage is on the high side. Solar Choice publishes solar PV system prices from across Australia based on raw pricing data from our installer network. Smaller system sizes (up to 10kW) are included in our Residential Solar PV Price Index articles, while larger systems (between 10kW and 100kW) are included in our Commercial Solar PV Price Index articles. Neither of these articles specifically includes pricing for 9kW solar systems, but it is still possible to get a good indication of where pricing would come in. The October 2014 Residential Solar PV Price Index shows that the average dollar-per-watt (1 kilowatt = 1000 watts) price for a fully installed 5kW system was around $1.62 ($1.62 x 5000W = ~$8,100), while pricing for a 10kW system was around $1.45 ($1.45 x 10,000W = ~$14,500). Making the reasonable assumption that the $/W cost of a 9kW solar system would be somewhere between these two, we come out with an average price of $1.53 ($1.53 x 8000 = $13,815). 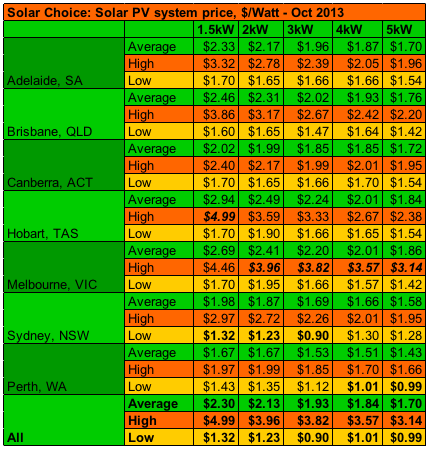 Prices from Solar Choice’s Solar PV Price Index article for October 2014. You can receive a free and instant Solar Quote Comparison from solar installers in your area by filling out the form to the right of this page. Instant quotes will include systems sized 1.5kW, 2kW, 3kW, 4kW and 5kW, but prices for larger system sizes (including 9kW) are available on request and through consultation with our team. As with any solar PV system, actual power output for an 9kW system will depend on a number of variables. Perhaps the most basic factor included in the list above is the amount of sunlight that is available in a given region. The metric used by the solar industry to measure solar potential is ‘Peak Sun Hours’ (PSH). A Peak Sun Hour is the equivalent of one hour of full sunlight. As the sun moves through the sky, the strength of the rays it casts on a particular location varies. Most places experience peak sun around noon or 1pm, while sunshine is weaker in the late afternoon and early morning. Sydney, for example, gets approximately 4.8PSH per day, averaged throughout the year–more in summer, less in winter. (Values for other cities can be found at the bottom of our Solar System Payback & ROI Calculator). 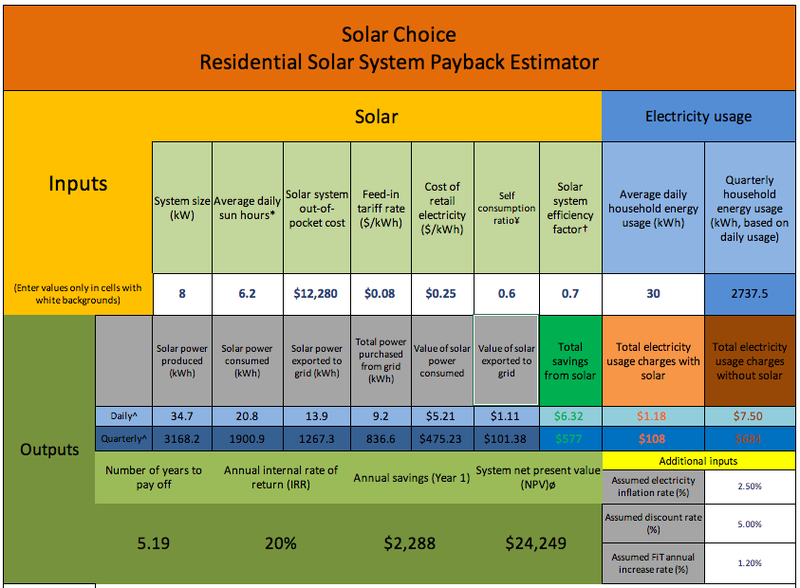 Like solar system output, payback periods and returns on investment for a solar system of any size are dependent on a number of factors. The main things that make solar power such an excellent investment in Australia are the relatively low cost of having a system installed and the high cost of electricity. Meanwhile, state-based solar feed-in tariffs, which were once the primary incentive mechanism for going solar, have been reduced and relegated to a less important reason for going solar. Feed-in tariffs are now either voluntary or minimal in most of Australia–meaning that an electricity retailer is not required to pay solar homes and businesses anything for their excess power. Understanding the implications of this is key to getting the most out of a system. If you own a solar system, you will want to consume as much of the power it produced as possible because this will save you the greatest amount of money on your power bill. The rates for electricity purchased from retailers (anywhere from 18¢-27¢ or more depending on the location, retailer, and tariff in question) are significantly higher than the rates offered by the same retailers for excess solar power (which max out at 10¢/kWh in most Australian states). Every unit of self-generated solar power which is used on-site by a home or business is a unit of electricity that does not need to be purchased from the grid–and will therefore save the system owner money. Electricity generated by solar panels flows first into appliances that happen to be running on-site–any excess is sent automatically into the grid. How can you ensure that you use as much of the solar power as possible? Step 1 would be making sure that you get a solar system that is appropriately-sized for your needs. Step 2 would be understanding your electricity usage profile and working to optimise your power usage. Want to learn more? Try plugging some figures into our solar system ROI calculator. Self-consumption is just one of the variables that can be adjusted to determine your likely payback time and return on investment.